Pollinating insects play a critical role in the ecosystem, people's lives. Pollinators, such as the monarch butterfly and the rusty patched bumble bee (listed in March as an endangered species by the U.S. Fish and Wildlife Service), recently have made headlines due to declining populations, primarily from habitat loss. These insects play a critical role in the ecosystem, as well as people’s lives, and human intervention is needed to help keep these pollinator populations abundant and healthy. Grasslands, vitally important to many species including pollinators, have become increasingly rare. 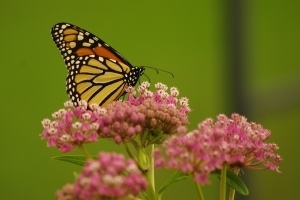 “Making sure pollinators have habitat that supports milkweed and other native, flowering plants is important to preserving these key species,” said Dan Kennedy, endangered species coordinator for the Michigan Department of Natural Resources. Through several habitat enhancement projects, the DNR – along with many partners, organizations and volunteers – is working to increase habitat for pollinators in Michigan. In southeastern Michigan, DNR staff is seeding wildflowers on 7.5 acres at the Shiawassee River State Game Area in Saginaw County to help restore pollinator habitat. Complementing this project, grassland habitat adjacent to this site is being enhanced for pheasants, which also will benefit pollinators. On the southwestern side of the state, in Barry County’s Barry State Game Area, there are several sites scheduled this fall for work that will help a number of grassland species, including pollinators. In addition to the DNR’s efforts, many other organizations are supporting projects to improve pollinator habitat in Michigan. 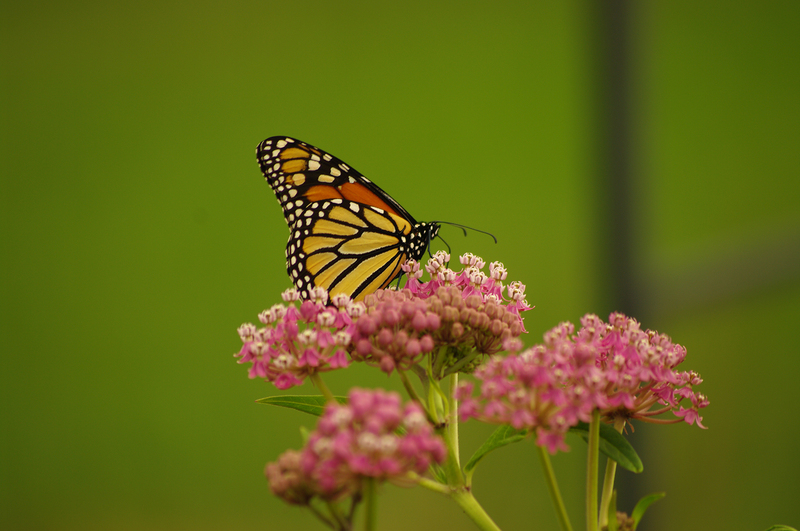 In June, TransCanada partnered with the Save Our Monarchs Foundation and many volunteers to plant 6,000 native wildflowers around TransCanada’s Woolfolk Gas Plant in Big Rapids, Michigan. As part of their Pollinator Pathway Initiative, TransCanada and the Save Our Monarchs Foundation planted 40 different native wildflowers and grasses at this habitat restoration site. Currently, 4,000 acres already are being utilized as pollinator habitat. This fall, the organizations will continue their plan to seed an additional 7,000 acres across other TransCanada rights-of-way with native wildflowers. The DNR also offers grant funding for wildlife habitat projects. See the wide range of wildlife habitat projects happening around the state with this interactive map. Even for those who don’t have a large amount of land, there are ways to create habitat that helps pollinators. More information about creating habitat for pollinators, like the monarch, is available on the Monarch Joint Venture page. Other helpful resources include the U.S. Fish and Wildlife Service's steps for building a pollinator garden and the Michigan State University Extension’s Pollinators & Pollination page, which also offers information on gardening for pollinators. Additionally, citizens can help inform conservation decisions in Michigan by reporting monarch sightings at the Journey North webpage and bumble bee sightings at Bumble Bee Watch. /Note to editors: An accompanying photo is available for download below. A suggested caption follows.